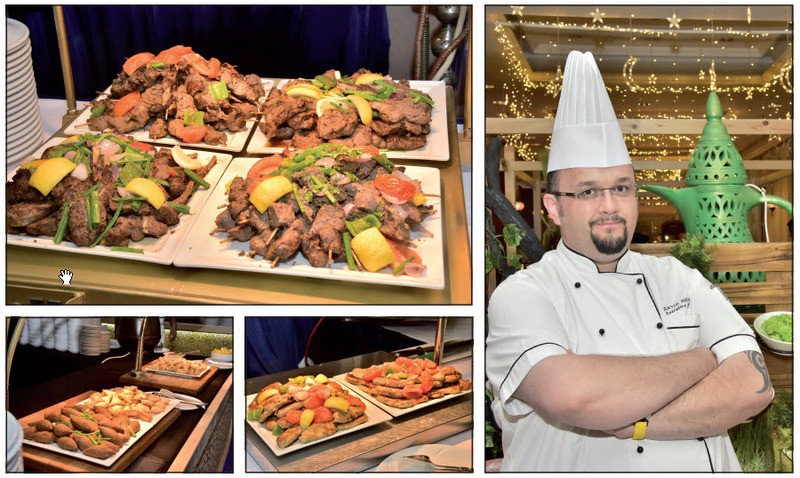 Executive Chef David Miras and his team of chefs have pulled out all the stops to entice families and corporate bookers to its conference centre with an impressive range of Arabic favourites and international cuisine delights. The conference centre and ballroom has once again been transformed into a traditional tented triumph of design, comfort and style, with a beautifully-lit entrance. For the very first time its designers have created secluded seating for families and, to add a special twist to the offering, alongside the delicious flavours and relaxed ambience, daily and weekly rewards will be given away – from dinner vouchers to electronic goods – as part of the spirit of giving. The ‘island buffet’ started with popular Ramadan juices and dried fruits, including everyone’s favourite Vimto, alongside Lumen with Mint and Rose Milk, always ideal for that first taste of refreshment after a full day of fasting, broken too by energising bites into dates, figs, dried apricots and a handful of walnuts. The spread of cold messeh, which included a superb Green Beans Lebanese-style Salad and crisp international salad dishes, was impressive and the chefs, waiting and set-up crew should also take a bow as a result of the impressive display and arrangements of the dishes. Eating out is so much more than just the food, the visual impact plays as an important a role, in my opinion, and little touches of excellence make all the difference. It displays care and a desire to please and brings a smile to the face and that’s exactly what the cute crafted camels placed in prominent positions and the heart-shaped display of spectacular sushi were guaranteed to deliver. The hot messeh included a superb Spinach Fatayer and Cheese Sambousek and crowds of hungry hacks quickly descended on the live Chicken Shawarma station. The Lamb Ouzi, a whole lamb slowly cooked with oriental rice and yoghurt and served with cucumber raita, was majestic and a crowd favourite, of course. Indian dishes, such as Prawn Biryani and Mutton Malala, looked tempting but I had my eye on the Arabic mixed grill with Shish Kebab and the most amazing Lamb Chops. Those with a sweet tooth will not be disappointed and my standout desserts were the Vanilla Profiteroles and the Chocolate Mousse Verrine and you can’t miss the crazy Turkish ice-cream magicians dishing up their delights with bell-ringing, twist and turning artistic flair. The children (and big kids like me) absolutely love it. Crowne Plaza Bahrain also aims to provide the ‘perfect atmosphere’ with special menus that can be tailor-made to host both corporate or private Iftar and Ghabga events, said general manager Gilles Nicolas. “We have created a plush ambience with specialised menus that can cater to your very own exclusive event, where events from 30 up to 1,000 may be accommodated in private rooms,” he added. As Ramadan is a time of giving, this year the Crowne Plaza Bahrain will be making donations to the Children and Women’s Wellness Charity.